"Cockles and Mussels" is a dirge for an 18th century fishmonger (almost certainly an historical figure) who died in one of the cholera epidemics that regularly swept the city of Dublin. Molly possibly was a part-time bawd and the song is alluded to with sexual innuendo by Leopold Bloom, the hero of James Joyce's Ulysses. The doleful ballad, invested with bizarre brio by football crowds, has become Dublin's anthem. 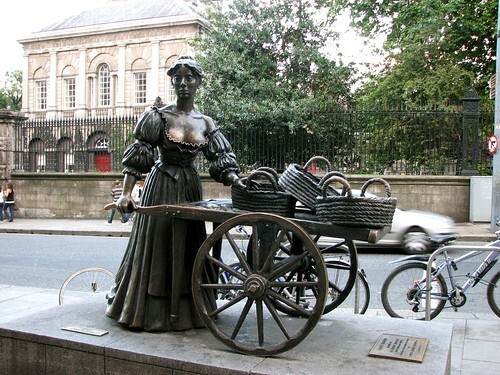 A life-size bronze statue of Molly pushing a handcart and wearing a rather revealing dress stands across the road from Trinity College, Dublin. Dubliners, who have taken to giving their statues rhyming nick-names refer to it as "The Tart with The Cart".